Since the opening of Anoikis space almost 6 years ago, capsuleers had gained a solid practical understanding of wormhole space. Oh, there was plenty of mystery surrounding it, but the community, particularly those who lived there, had a good idea of how to take advantage of the resources available. But us pilots were not the only ones who saw the potential of Anoikis space. Imagine our surprise, not even 6 weeks ago, shortly after Caroline’s Star first made her appearance, when not only did we discover that there were new systems connected to the wormhole network, and not only did each and every one of these systems show signs of massive devastation, but that the Sisters of Eve have been inhabiting at least one of those systems. And, in fact, they’ve been doing so for quite some time. Eight Sisters’ stations, in various stages of array and disarray, can be found in a system they’ve named Thera. The Testing Facility is clearly Gallente in origin. This, of course, raises any number of questions. How did the Sisters even get to Thera in the first place? 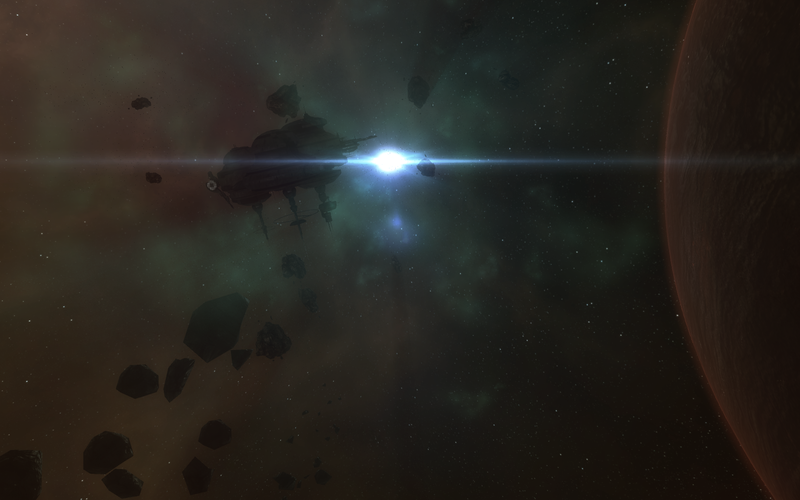 The wormholes between New Eden and Anoikis are fairly well-mapped, if not always well understood. 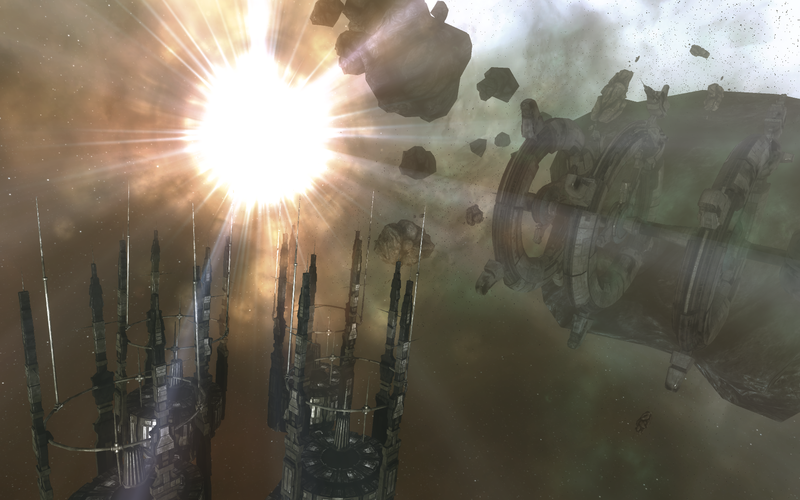 If the old wormhole network connected to Thera, pod pilots would have discovered it in the 6 intervening years. So the Sisters didn’t just stumble through a wormhole to find it. Then how did they get here? And what, exactly, happened here? 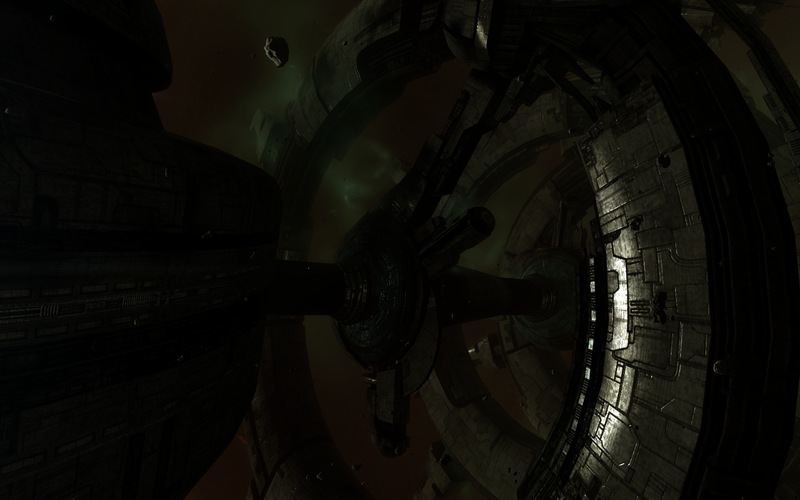 The devastation is evident throughout the new wormhole systems, but particularly in Thera. Over the years, the Sisters had managed to establish 8 stations throughout the massive system, and only 4 of them now remain active. The other 4 are but drifting wrecks now, and with the Sisters being characteristically tight lipped on the subject, we’re left to only speculate how these stations met their fates. Apparently set up to study nearby Talocan technology, this station has been buckled and broken by numerous impacts, possibly from material thrown up from the devastated planet below. The array of Talocan static gates nearby is eerily intact and seems to be functional to some degree. The Exotic Specimen Warehouse sits about 200 km off of the Testing Facilities. The station itself seems to be built to Gallente specifications. Close examination of the station shows the damage seemed, oddly enough, to be greatest near the docking port of the station. Almost as if there was an explosion inside the station that forced its way out, rather than from the outside in as Aura’s scans suggest. The station’s graceful rings, though no longer spinning of course, add a surprising serenity to the site, despite the near total devastation. 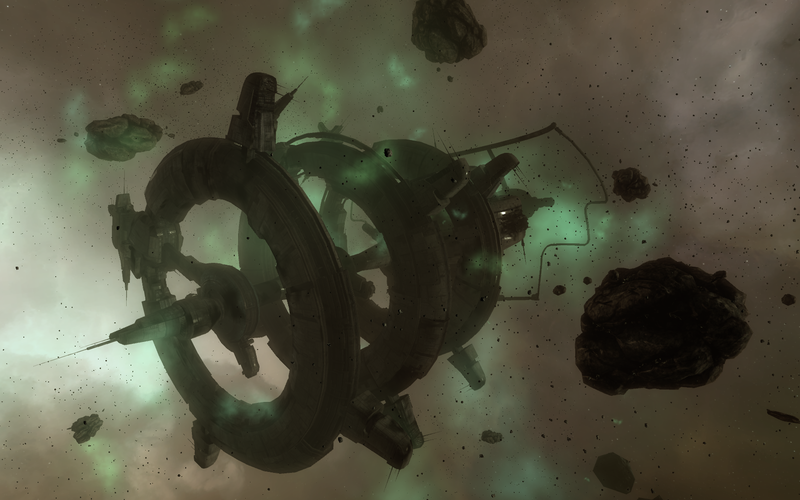 The entire station is enclosed in a dim greenish glow that I’m not immediately able to identify, and with significant amounts of debris nearby, navigation was a hazard. 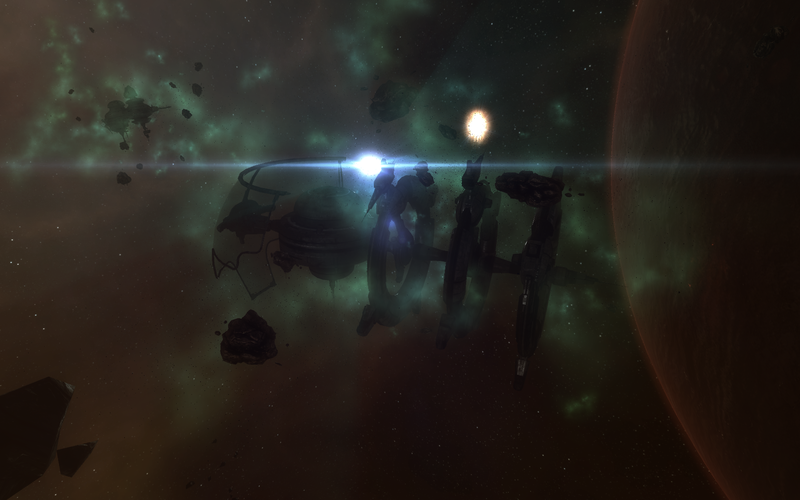 Sunlight glints off the Warehouse wreck, surrounded by a dense debris field. A close up of the central complex of the Warehouse. Note the radioactive fullerene gas clouds. 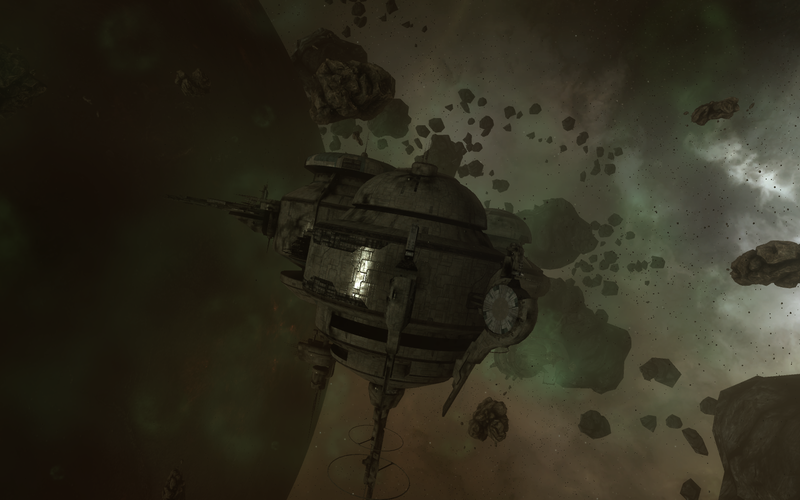 Wrecked and battered, though largely intact, this station and its neighbor must originally have been sheltered in the lee of the planet to some extent. Disruption of orbital mechanics in this system make it difficult to be sure but the proximity of Thera III to the central star and the survival of recognizable station ruins requires an explanation of this kind. Some have suggested wilder theories concerning the nearby Talocan technology. The station itself seems to have functioned as a vast storehouse of materials and specimens gathered from the core of the system. Not much remains and large quantities of radioactive fullerene gas seem to have bled from the ruptured storage vessels. A nearly pristine Talocan static gate remains untouched next to the ruined station. Encased in the same debris and eerie green glow, which I now knew was the aforementioned radioactive fullerene gas, the Warehouse gave few clues as to the other materials it held. 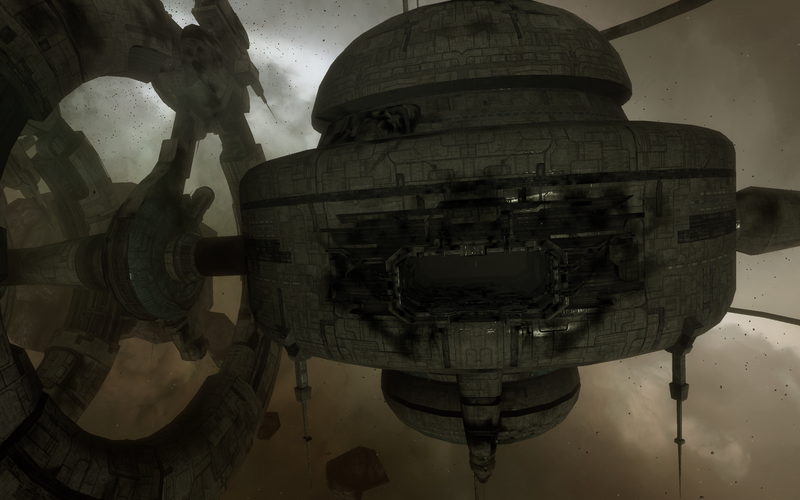 The station itself was heavily damaged and cratered. Although we have no indication of exactly when the devastation wracked Thera, given news reports, it seems likely the devastation was recent. Given how silent the station is now, the thought that just weeks ago these two stations were teeming with life and science is a bit too morbid for my tastes. Quite a few mysteries remain to be solved. Events seem to be accelerating quickly these days. So much so that at times I can hardly keep up. 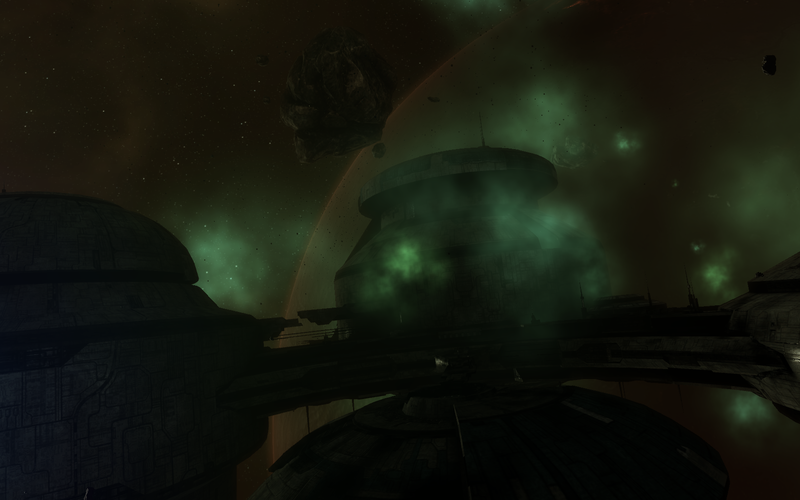 But I suspect the mysteries surrounding Thera are going to be with us for a while. I heard it once said that there 4 kinds of information: the information we know we know, the information we don’t know we know, the information we know we don’t know, and the information we don’t know we don’t know. With the events surrounding Caroline’s Star and Thera, mysteries still abound but at least we’re moving items from the ‘information we don’t know we don’t know’ category to the ‘information we know we don’t know category.’ It’s not the most heartwarming of realizations, but in times like these, I’ll take what I can get. This entry was posted on February 15, 2015 by mark726. It was filed under miscellaneous and was tagged with Anoikis.